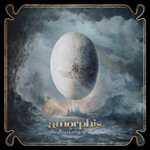 Amorphis returns with their tenth studio album The Beginning of Times. They continue their adventure into a symphonic and melodic, sometimes melancholic and dark, mixture of heavy, power, and death metal. Typical of Amorphis, though following a course developed over the last several albums, the band continues to evolve. To the songs, also typical of an Amorphis recording is a certain density to the arrangements. There's nothing subtle about the depth of composition and instrumentation. Significantly, keyboards seem to have a greater presence throughout The Beginning of Times both in providing atmosphere and solo performance. Take note of Battle for Light and You I Need as only two examples. Otherwise, Amorphis can deliver a varied score of songs (and, therefore, not quite as predictable as 2009's Skyforger). For instance, Reformation is very symphonic and likewise melancholy. Near to this is Crack in a Stone which is also symphonic, but heavier, and offers layers upon layers of riffs and synths. Escape is more up tempo, starting with a rock feel, only to add death vocals and end in quick power metal. Amorphis has always had some native or folk elements in their arrangements (and as usual in their lyrics), and you can hear them in Song of the Sage and Three Words, possibly the best cut here. Finally, also as expected, Amorphis mixes in death vocals in many songs. Most times they appear as accent or in tandem, sometimes as on My Enemy or Crack in a Stone they take the lead. In the latter case, this use gives the song a more modern sense. (Not sure who's supplying the DVs, but it could be either producer Marco Hietala or vocalist Tomi Joutsen, or both). Still, many times, while enjoying an intense and satisfying song, they pop up unexpectedly and trouble your listening experience. Nevertheless, The Beginning of Times finds Amorphis in grand form, doing what they do best: dense symphonic and melodic songs that blur the lines of heavy, power, death metal. Recommended. The Beginning of Times finds Amorphis in grand form, doing what they do best: dense symphonic and melodic songs that blur the lines of heavy, power, death metal.